Ruth I. McVety (Andrews), a lifelong resident of West Haven, passed away peacefully at home, surrounded by loved ones, on August 7, 2018. She was the beloved wife of 71 years of the late Walter W. McVety, Sr. Born in West Haven, on July 3, 1924, she was the daughter of the late Joseph August Andrews and the late Mary (Erickson) Ursini. She is survived by her son Robert McVety (Judy) of Hamden, daughter Judith Mandry (Ray) of Osprey, Florida, grandchildren Brenna McVety, Deidre McVety Bauco, Kyla Wedsworth, Kate Donahue, Erik Turnquist and Kirsten Grills, and a brother, John Andrews. In addition, she is survived by her great grandchildren, a great great grandchild, nieces and nephews. Ruth was pre-deceased by daughter Kathleen Donahue and son Walter W. McVety, Jr.
An accomplished artist and painter, doll maker and quilter, Ruth was also a talented cake decorator who made beautiful cakes for family weddings and occasions. She was an avid gardener and won an award from the City of West Haven for the appearance of their home and gardens. A loving mother and grandmother, Ruth embraced us all and elevated us by her example, loving family, in all its various forms and personalities, with an open heart and gentle acceptance. May we always remember the lessons she taught us of approaching each day with purpose, hard work and above all, loyalty and love. Visitation will be held Sunday afternoon, 3:00-6:00PM at the West Haven Funeral Home at the Green. A Celebration of Ruth’s Life will begin at 6:00PM. Interment will be held Monday at 10:00AM at Oak Grove Cemetery. 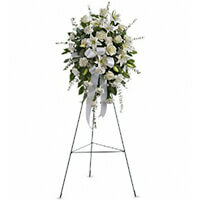 For online condolence, please visit our website at www.westhavenfuneral.com. The family wishes to thank the staff of Connecticut Hospice for their kind and caring support. Donations may be made to the Salvation Army or Connecticut Hospice. Additional Information	A Celebration of Ruth's life will begin promptly at 6:00PM. Words can't express how saddened we are to hear of your loss. Our hearts are with you in this time of sorrow. Our deepest sympathy to the family. We were fortunate to be able to meet this remarkable lady. I've never met anyone like Mom McVety. Even after my divorce from her son, Walt, she continued to be supportive and loving, telling me that I would always be part of the family. I remember my first Christmas with her and Dad McVety. When we arrived with my two young children, as if they had always been part of the family, there were piles of presents for them under the tree. She always made me feel loved and accepted. That was her special gift. She, Dad, my father and my former in-laws would gather at my house for Easter each year and talk and laugh...a beautiful experience for my and Walt's kids. It was particularly sweet to be able to say "goodbye" to her and tell each other how much we loved each other. She passed so gracefully...a memory I will cherish forever.